We’ve covered lots of boats, and we love to sneak a peek at true workboat yachts that come with a working heritage. What if you could pick up an old steel hull, in good enough shape to epoxy paint for longterm rust protection, and fit an honest interior, all for what a used trawler yacht might be in the used boat market? Consider an Army T-boat! Mike Effort is a tug man, always has been. In fact, he started his tugboat career at eighteen, and was Captain Effort by twenty one. At twenty two he got his license as a docking pilot, and has been a Baltimore Harbor Pilot ever since. A no-kidding, real-life waterman with more experience than most of us can comprehend. Mike has this thing about boats. He likes them big, he likes them strong, and they have to be as rugged as the tugs he runs. A tough boat for a tough captain. He knows something about everything related to boats. Period. We first met Mike Effort at the Annapolis Powerboat Show. He stopped by to say hello, “Really enjoy the magazine”, and he then showed us a couple of photos of his own boat, MI-T-MO. Effort always wanted to make a tug into a yacht, but he knew it wasn’t as easy as it sounded. Most tugs are much smaller inside than you might imagine, and the bigger tugs are all engine room and fuel tanks. In his years with Moran, Curtis Bay Tug &Towing, and McAllister Tugs, Mike spent time on them all, but he still had this idea that one day he might do a tug yacht. In 1991, Mike purchased an ex-Army T-boat from Walker Dive Contracting of Laurel Springs, New Jersey—Hull #504. The “T” stands for transport/tug, and T-boats were used by the Army for lots of different roles, from hauling cargo to pushing large barges and ships. Mike had had some experience on T-boats when he was in the Army, stationed at Ft. Eustis, Virginia. His appointed service duty was, of course, working on tugs. While early T-boats were built in wood, in 1952–1954 the U.S. Army commissioned 86 steel T-boats, built by three yards—Higgins Industries of New Orleans, Missouri Valley Shipyard of Leavenworth, Kansas, and National Steel in California. These boats traveled the world. Number 504 sat unused at the Charleston, South Carolina, Army Depot for years, before being purchased for survey work by the Finger Lakes Institute of Watkins Glen, New York. Named Glenn Searcher, she was later renamed Ocean Searcher when sold to Walker Dive Contracting. Mike bought her in 1991, and started her transformation from working vessel to liveaboard cruising boat—and part-time working tug. Keeping it simple and true to the working nature of a real T-boat, Mike has transformed MI-T-MO into a comfortable and capable cruising boat. With a couple of talented friends, Mike extended the wheelhouse cabin roof, gutted then rebuilt the interior, and made the cargo hold into a master stateroom. The renovation continues today…when MI-T-MO isn’t out cruising. Mike replaced the original Buda when he repowered MI-T-MO with a pair of Detroit Diesel 6V71s rated at 250 horsepower each. No big deal, just cut a big hole in the side of the boat, take out the enormous Buda in pieces, weld in a watertight hatch to plug the hole. This may be standard practice for steel workboats, but it sure is not for the faint of heart! Since moving aboard during the summer of 1992, Mike (and his significant other, Ramona) have taken MI-T-MO three times up to New England from her home in Baltimore, Maryland, as well as two trips down to Florida. The projects continue, but after 12,000 miles of cruising and living aboard her, they’re quite happy with MI-T-MO. Mike recently returned to Baltimore from Florida, bringing her up solo. Imagine handling a 90-ton small freighter by yourself! Stepping aboard through the midships gate, it is impossible not to know that you’ve stepped onto a real ship. The massive steel construction is everywhere, from bulwarks, to steel ladders and steps, to submarine hatches in the deck, large watertight hatches with dogs, to cleats the size of Michael Jordan’s sneakers welded directly to the steel deck. This is a no-foolin’ workboat, and Mike has not spent a penny to make it otherwise. After removing all rust and corrosion, Mike and his friends applied Devoe two-part epoxy primer on all interior and exterior steel surfaces. The paint that goes over the epoxy is cosmetic, as the two-part coating is the best way to handle steel in a hostile marine environment. And, as painstaking as that job may be, it only has to happen once. The surface paint gets renewed every three years or so. It was a blustery day when we visited Mike aboard MI-T-MO, yet she felt as though she were aground, unlike the neighboring boats. 90 tons does make a difference! Mike says that due to the round shape of her hull, she does roll under way in rough seas, but the motion is slow and predictable. He is considering paravanes, but it hasn’t been a pressing need. Wide and protected side decks run the length of the boat, and the entire exterior remains a platform for continued tug work—so the rough and ready feel of the boat is necessary. Everything is oversized, completely mil-spec in construction, intended for a hard, but long life. Up forward, there is a 110VDC windlass to handle the two anchors—150-lb. and 200-lb. Danforth anchors on all chain rodes. The use of 110VDC is common on older tugs and workboats, and Mike told us it is preferred for a number of reasons, although he did extensively rewire the boat to handle 32VDC, as well as 110/220VAC for the various onboard electrical equipment. A large fo&apos;c&apos;s&apos;le hatch leads down into the forward stateroom/galley, providing both ventilation as well as easy access between galley and deck. During the season, Mike and Ramona eat up on deck, on a large picnic table that sits on deck, just forward of the pilothouse, under a blue awning rigged for shade over the main cargo-handling boom. The large awning covers an area of deck over what used to be the 17&apos; by 17&apos; cargo hold, and is now the master stateroom. Since Mike welded over the cargo hold hatch, they retrieved some wonderfully usable deck space—a mid-size automobile would stow here just fine. The aft deck is also all business, complete with towing bollard. A watertight hatch opens for access into the lazarette, which might as well be called the basement. Mike hasn’t done much yet to this lazarette, but it is an enormous area sealed off from the rest of the ship. It could be made into additional staterooms, mega storage, or just a big empty watertight compartment. Mike and his buddies extended the boat deck to provide overhead protection on the side decks and aft deck, and the result looks great, as well as providing good protection from tropical sun and rain. It also creates a huge boat deck. The 13-foot Nautica dinghy seems almost small up there. There are two watertight doors into the pilothouse, up a couple of steel steps from the deck. There used to be inside access from the pilothouse into the rest of the interior, but Mike has all but removed that access by putting a day head on the other side of the door. He doesn’t find it a problem. This wheelhouse is all tug boat. Mike proudly told us that his lovely wood wheel came from the last steam-powered tug to operate in Baltimore Harbor. He ought to know, as he was the tug’s captain. All wiring and switches are mil-spec and completely overdone. The rest of the pilothouse reflects the control center of a working tug. Instru­mentation consists of basic equipment, but it is all big, heavy, commercial gear. The saloon was kept as a large living room, rather than sharing the available space with a galley as is sometimes done in T-boat conversions. It was a conscious decision, and Mike is glad to keep the saloon large and open. The room measures 9&apos;6" wide by 15&apos; long, and there is 6&apos;1" of headroom. Two huge watertight doors allow entry from the side decks, and Mike’s construction team cut out all the portholes and replaced them with opening windows. The feeling is bright and open, with excellent visibility. While interior decorating remains unfinished, it is clear this will be a rather pleasant living room when completed. Real chairs, sectional sofabed, baseboard heating, Berber rugs, the works. The forward section of the saloon includes a built-in wetbar, and to the left of the wetbar is a door into the day head and engine room. The opposite side of the bulkhead opens into a short corridor that goes down a flight of metal stairs into the hold, er, now master stateroom. There are three inches of insulation in the sides and roof of the saloon. Cozy. The day head is located in a grate-floored compartment that sits overtop the engine room. The grates are removable for getting machinery in or out, and are commonplace onboard workboats. This compartment is sort of a mud room in its utility, a great place to keep lights, cords, electrical panels, paints, and other necessary but stored-away-somewhere items. A metal ladder leads down from the grated floor, into the largest engine room we’ve seen to date. This Holy Place measures roughly 17&apos; by 17&apos;, with 6 feet of headroom throughout. Talk about an engine room! Centerline in the compartment are the side-by-side Detroit Diesel 6V71s, mounted together to a Falk marine transmission with Twin Disc clutches. Mike can run the boat on either engine or both engines; together they produce 500 horsepower. The Falk gears are designed to handle up to four separate engines driving a single shaft through 4:1 reduction gears, spinning the 48" by 54" four-blade propeller. While four engines would still fit within the space left after removing the single Buda engine, Captain Effort just doesn’t see the need for all that extra horsepower. He normally runs the boat on one engine, and both engines only get used during tug operations. Under way at 8.6 knots on one engine running at 1,300 rpm (spinning the prop at 300 rpm), the fuel burn is 4.8 gallons per hour. That’s good efficiency indeed, and is an endorsement to the T-boat’s hull form. Along with the two diesel engines, there are two gensets. One is a ten kW Lister diesel genset that produces 220VAC. The second genset is a Hatz/Wisconsin single cylinder, air-cooled, hand crank-started diesel engine that drives both a 2 kW 110 VAC generator and a 32VDC alternator. These varied power sources serve all of the different onboard electrical needs. The ship’s battery bank consist of four 8V batteries (each with 250 Ah capacity), wired as a 32VDC system. As far as tankage aboard MI-T-MO, there are two 500 gallon fuel tanks and a 150 gallon day tank for the gensets, for a total of 1,150-gallon fuel capacity. Two water tanks hold a total of 400 gallons. Down the flight of stairs from the saloon brings you into the master stateroom. 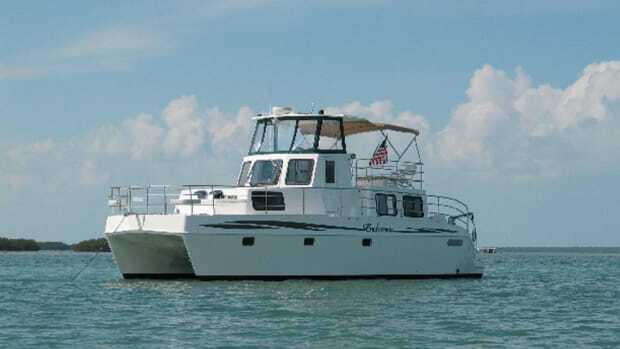 Taking advantage of the full 17&apos; by 17&apos; cargo hold area, Mike decided against converting this area into multiple yacht-sized staterooms, as he wanted a real home. So instead of small bunks and so forth, this master stateroom has a queen-size bed, real furniture chests of drawers, a full domestic bathroom-sized head with full-size tub/shower, stacked full-size washer/dryer, built-in desk and entertainment center, and enough room left over for the visual open feeling of a true master bedroom. What can I say…Mike and Ramona didn’t want to skimp on living space, and they’ve taken this to heart. After all, how often do guests stay aboard beyond the needs of a sofabed in the saloon? There are large opening portholes in this stateroom, and due to the construction of the cargo hold in this hull, headroom averages a full 7&apos;4". Moving forward into the next area of the boat brings you into the galley and crew quarters. It was decided to keep the galley in its original location, although Mike told us other conversions have moved the galley up to the saloon level. But it works just fine right where it is, and the added fo’c’s’le hatch allows easy food transfer up to the deck where most meals are served, weather permitting. The refrigerator is located on the centerline, in the only square corner in the entire 65 feet of boat. Mike and Ramona updated the galley, of course, but kept the overall layout and some of the original furnishings. Across from the galley are two single bunks, which don’t get used much, and a small guest head on the outboard side of the hull. All things considered, the layout of MI-T-MO is centered around real living space rather than maximizing accommodations. Less is definitely more on this boat. Compared to other T-boat conversions, the engine room space is intact (other have made it smaller to fit more staterooms), there is a big saloon (rather than a galley/saloon combo), and there is superior space for two people (rather than smaller but more numerous staterooms). If they did it over again, Mike told us he might move the queen bed into an island configuration, and perhaps rearrange some of the other details, but he is pretty happy with MI-T-MO just the way she is. MI-T-MO continues to evolve as Mike and Ramona proceed with their conversion. Based on Mike’s research, a good T-boat hull (ie., the metal is in good condition) can be had in the $20,000 to $50,000 range. If the boat has been repowered, expect to pay much more. It cost around $145,000 to build the original T-boats back in 1953. Once Captain Effort fully retires from his harbor pilot career, MI-T-MO and crew will head south again, this time for good. 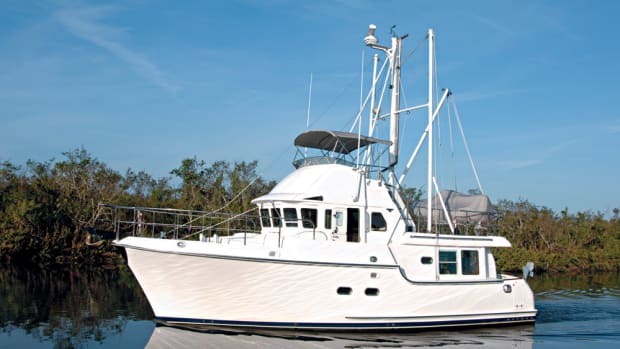 The boat will continue to get better each year as they find the time to fair, paint, remodel—with all the diving, cruising, and tropical paradise living they plan to enjoy. A project like MI-T-MO isn’t a weekend fixer-upper, and Mike warns that anyone considering such an effort must be a good hand at electrical, hydraulic, welding, and mechanical work—or have big bucks to spend to have the necessary work done. If you can find a good hull, it’s possible to make a T-boat into a good cruising boat for not much more than an additional $100,000 to $150,000. Not a bad cost, considering you wind up with an efficient, steel 65-foot behemoth capable of serious passagemaking. It’s not a boat or project for everyone, but then again, one-of-a-kinds are like that. They are unique, with tremendous character and depth that just doesn’t come from a production line mold. The same can often be said for the people these boats attract. And that’s just what our magazine is all about. Passagemakers…the boats, the people, and the lifestyle.